Marauding trespassers are threatening to stampede the cattle. 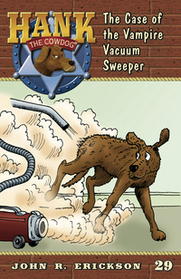 It’s Hank the Cowdog, Head of Ranch Security, to the rescue as he: tracks down enemy agent, Mysterious Esther, escapes the relentless Vampire Vacuum Sweeper, and confronts Buster and his gang. Will Hank prevail and save the ranch? Find out in this actionpacked episode.